I believe the term "Feast your eyes" was invented for precisely this sort if thing. The Rennaisance Fire Cross is designed in the orthodox, gothic style of crucifixes, with a red-crystal twist that mesmerizes admirers. The swoops and jangles of this gorgeous pendant can keep your eyes busy for hours (well, several minutes at the very least). Dangling gracefully at the center of the cross, below the sacred-feminine Fleur de Lys, is a red crystal heart. 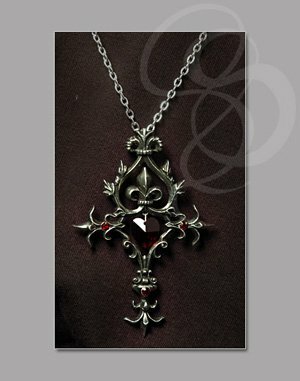 This crystal is the focal piece of the crucifix and serves as a symbol of the passion that the bearer posseses. 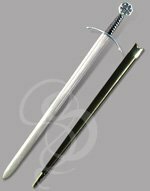 This is truly a fantastic piece of craftsmanship, designed and hand crafted in England by Alchemy Gothic. Inlcudes a long silver chain. Materials: High Quality English Pewter, Inset with Cut Red Crystals.